Currently, I have about 35 board games on my shelves that I have not played. 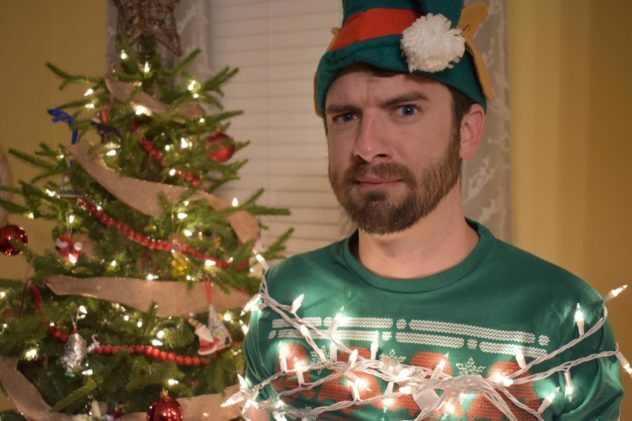 So this holiday season, I think I’m going to put some different types of items at the top of my list. Maybe some new pots and pans. A new jacket. But then about a dozen board games after that. I played this game at Atlanta Game Fest on a whim. My friend Melissa was just about to start a game and invited me to join them right at the last minute. I quickly learned the rules, we played a round, and then everybody was ready to move on. I, on the other hand, was smitten. 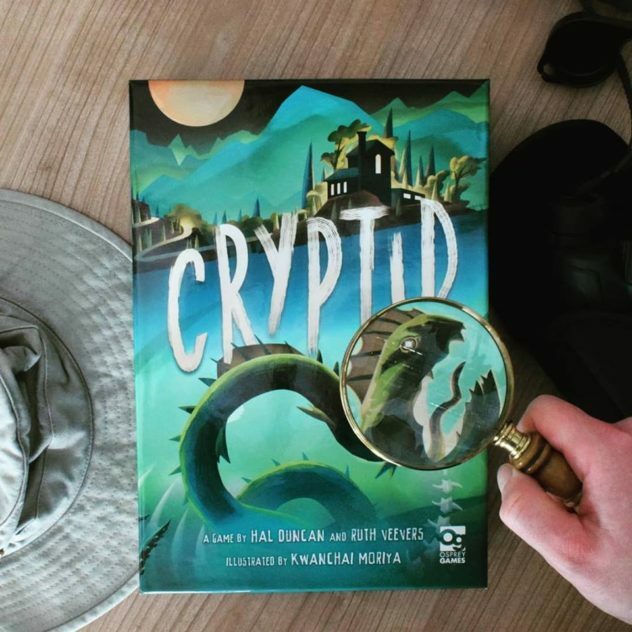 Cryptid tasks you with finding a hidden monster somewhere on the game board. Each player is given a rule book containing over a hundred different rules. A card is drawn and played, which tells every player one rule in their particular book that applies for that game. This could be something like “within one space of a forest” or “within two spaces of cougar territory”. Players then take turns asking other players if certain spaces on the board fit their rule, and different markers are used for yes or no. You continue until a player makes a guess that fits everyone’s rule, which means they win! I love hidden information games, and this is a different spin on that genre. It feels more like a cooperative game at times, as your mind wants to cooperate with the other players to find the location of the creature. But it’s not, and instead you’ll be trying to determine everyone else’s rule while not giving away your own rule, all while also narrowing down where that creature could be. Maybe I wouldn’t find it as impressive if I had played more games, or even if our game had gone longer, but for now, consider me intrigued. I’ve had a bit of hesitation with this game. I was not a huge fan of pointing guns at other people, even if they were fake guns. However, after playing this game a few times in the past year, I think I’m sold. Up to 8 players are competing to walk away with the most loot after a heist. Over the course of eight rounds, players will try to intimidate or even shoot the other group members, all while trying to avoid being shot themselves. This work is done with the aforementioned foam guns, which do a good job of being a little silly and really fun to pose with. On each turn, players play a card face down that determines if they are shooting blanks or really shooting bullets. Then, all players point their fake guns at an opponent, at which point the less daring folks can back out to stay safe. Those that stay in get to see the results of the cards played, and those who are still in get to split up the treasure, while those who get shot lose some life. Play eight rounds, don’t get shot three times, and you got yourself a game! As many of our family gatherings now involve 8 people, this is one that I think would make a great addition to the collection. We’re all competing simultaneously, you’ve got the chance for some pact making, and it’s not a hidden role game like many others in this player count. So I want it! When we first saw Caper from Keymaster Games back at Origins, my jaw dropped at the artwork. Once Erin and I sat down to play, I was enthralled with the gameplay as well. Now, it’s one I gots to have on my gaming shelf! The game puts two players in the roles of criminal masterminds (I’m sensing a theme here…), trying to recruit thieves and utilize equipment to pull off heists. Players use beautifully illustrated cards to assign their workers or equipment to three different locations, hoping to get a leg up against their competitor on the heist. Six rounds later, whoever has been the most successful pilferer wins! We have a ton of two-player games at our house, but it’s been great to have some new experiences from time to time. I’m not completely sold on Caper’s continued replayability, but even if it only comes out every now and then, we’ll at least get to appreciate the art anew each time we play. So it looks like a resource management game that has a bag and that some people compare to Emperor’s New Groove. The artwork looks amazing, there are a billion components, and there are tons of ways to score points. Many people are commenting on its high replayability and the quick ability to pick up on the rules. But most importantly, Bob says it’s good. So let’s go for it! Because we’re almost done with the second one, and we’re obsessed. Check out our review of the original here. That’s just a little bit of my list. Look out for lists from the rest of our crew over the next few weeks!